3 gang no wheel ( No front wheel) not needed no maintenance. Plastic baskets. 23 discs per drum section for greater picker coverage. holds 1800 balls weight 355 lbs. Call JIm at 1 800 407 6853 for more details. In stock ! 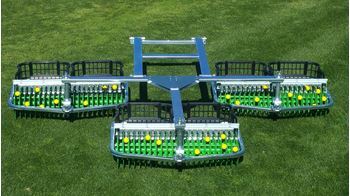 YOU WILL NEVER HAVE TO BUY ANOTHER BALL PICKER. PERIOD!